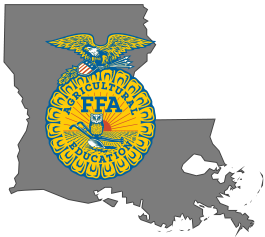 Louisiana FFA is a dynamic youth organization that provides students opportunities for leadership development, personal growth, and career success through agricultural education. Are you interested in becoming an FFA member? Does your chapter want to become affiliated? Get answers to your question here! FFA is an an organization of, by, and for its members. Student leadership is the cornerstone of achieving this mission, and Louisiana FFA is the premier organization for developing young people's leadership abilities in the state. Hard work should always be rewarded, and in the FFA, outstanding achievement does not go unnoticed. Multiple award and recognition opportunities exist for our members' agricultural interest areas. CDEs and LDEs are contests that FFA members compete in to test their skills learned through agricultural education instruction. This section includes CDE/LDE resources and registrations. The FFA hosts many conferences to promote premier leadership, personal growth, and career success within students including: State Convention & Expo, Days of Service, Leadership Camp, COLT Conferences, State Leadership Delegates Conference (SLDC), and Capitol Day. Investing in the future of agriculture means investing in the future of agricultural education students. Many scholarships and grants are available to Louisiana FFA members to further their education and build their chapters. Livestock shows are incredible opportunities for members to showcase their passion for working with animals and gain valuable skills such as responsibility, commitment, and professionalism. Today’s Louisiana livestock industry contributes over $3 billion to the state’s economy, and FFA members have multiple opportunities to be recognized for their success in livestock husbandry and showmanship. Stay in touch with FFA and engage with our members, advisors, and stakeholders across the state.